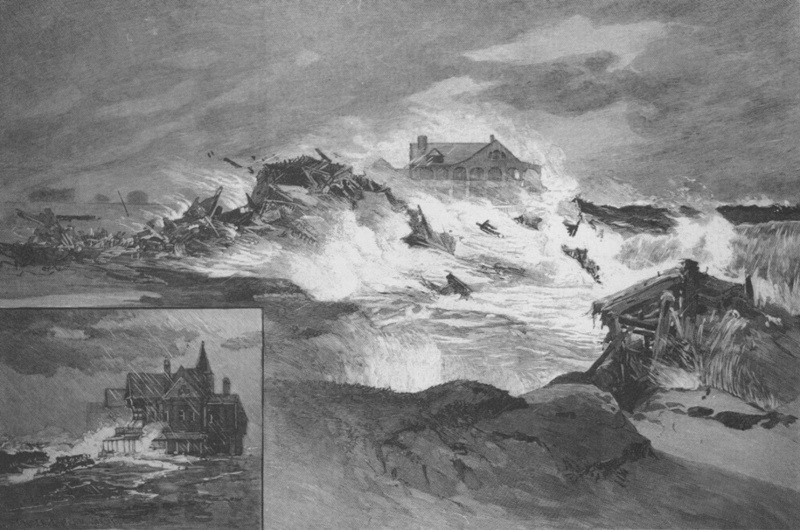 Destruction near Long Branch September 21, 1889, from Harper's Weekly. 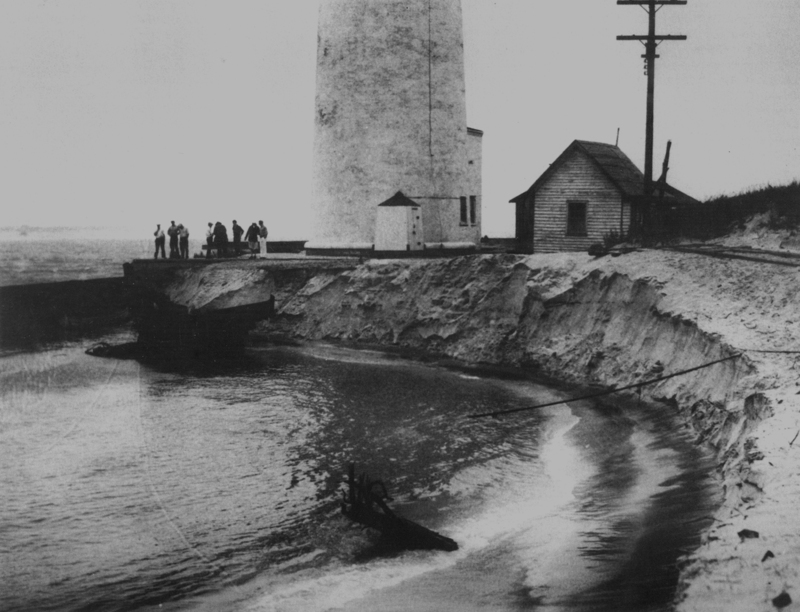 Barnegat Lighthouse was undermined by a hurricane in 1933. The Ocean City boardwalk was destroyed in the 1944 hurricane. 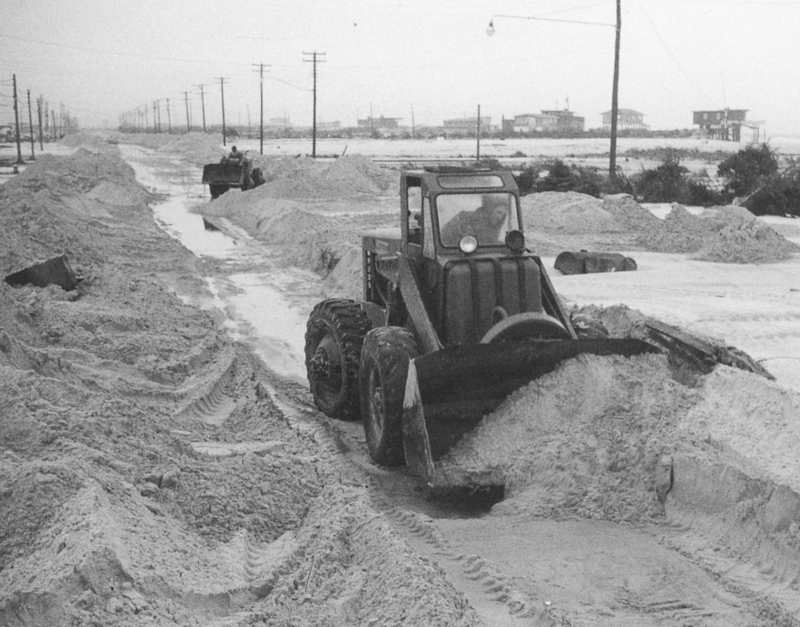 The ocean washed over Harvey Cedars in the three-day, March 1962 northeaster. 1962: The Army Corps of Engineers and Public Works departments of local towns rebuilt the Boulevard on Long Beach Island. 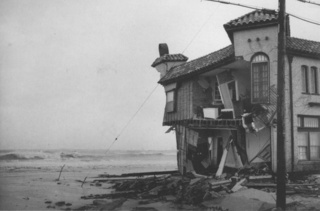 A wrecked home on the Brigantine oceanfront, 1962. 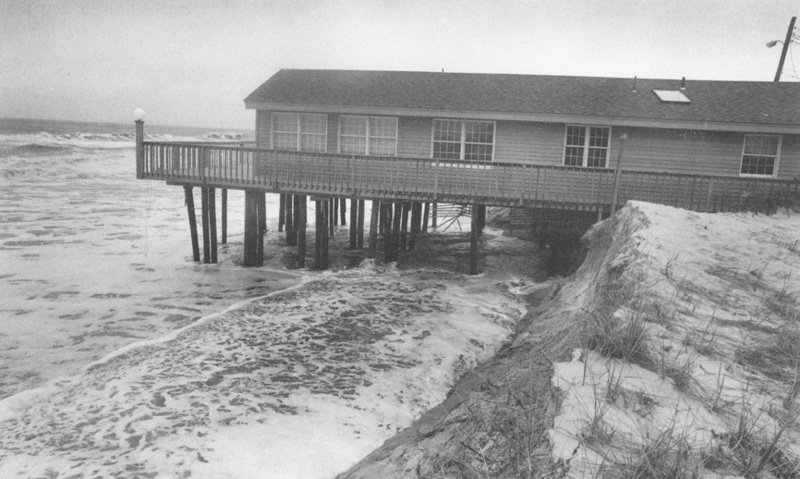 When dunes are destroyed by hurricanes and northeasters, oceanfront homes are threatened. 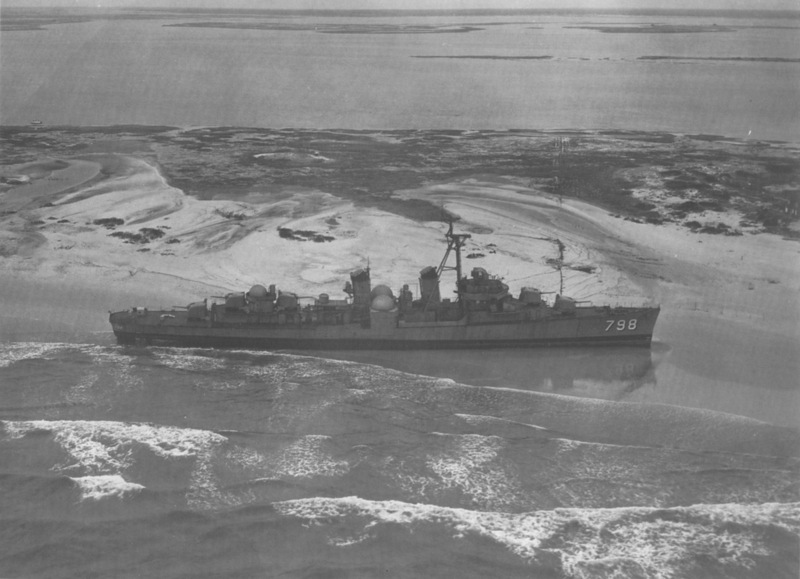 Above in 1962; below, 1992. Beach Haven's dunes are flattened in the December 1992 northeaster. One of the men must have recognized my anxieties and he reassured me we would make it. He said he had experienced other terrible storms at sea. Slowly the boat made some headway towards the mainland six miles away. It was only then that we saw the total horror of the storm. 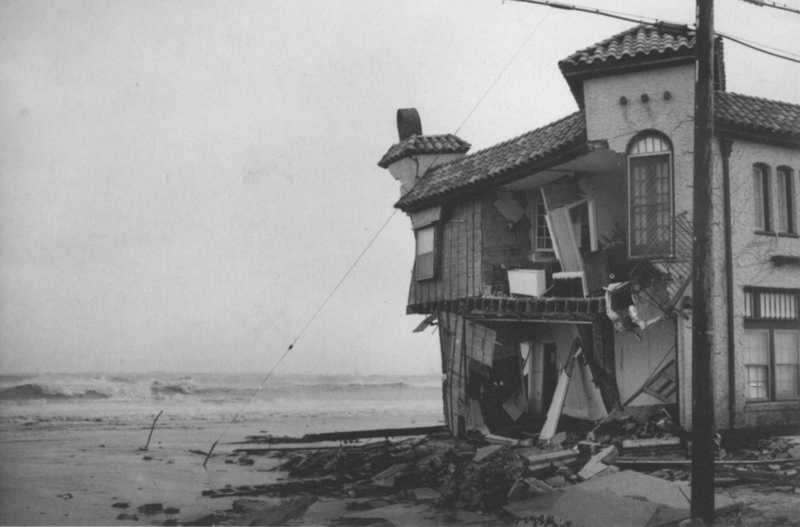 Houses had been extracted like huge teeth and swept into the sea never to be seen again. Others were flip-flopped on their sides, ripped apart, and debris was drifting aimlessly without a purpose or destination. Even though we had abandoned our home, I realized how lucky we were to be getting out of this hell alive. 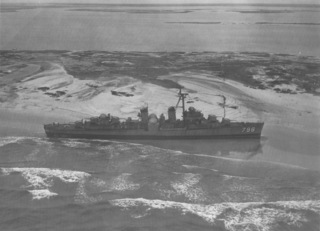 With much difficulty we continued to pick up others. Twenty-five of us were in that boat. With the whistle and howl of the wind, there was a hushed silence. We were too fatigued to speak. Massive buildings rocked like toys, roofs of tons of weight were lifted and carried rods away or torn into minute pieces. Huge strips of tin and metal were torn from places where they had been securely nailed and blown like sheets of paper for long distances. Steeples rocked and fell, huge buildings were crushed in like egg shells, vessels were swept like chips upon the shore. The rise of the water was at the rate of a foot every ten minutes. Verily it seemed as if "Hell were empty and all the devils were here." After the blow, one witness recounted, "You can walk ten miles at a time on trees that are down without stepping on the ground." I kept watching and more water came over and pretty soon it was washing down in steady streams and then it came on down the street and got higher and higher and higher. I said, "Mom, come on out here and look at this." She came out on the porch and said, "Aaaahhhhheeeeee. " I mean it scared her half to death. I was holding my little baby and was so scared. Then two men came up from the store; they said it was higher there and we should come down with the other people. They both looked at Elaine and since she was six weeks old, neither one wanted any part of carrying her. I wrapped her in a blanket and then a rubber sheet. I was scared to death she wouldn't be able to breath, the wind was so strong. One of the men went out carrying Caroline and another carried Chub. I wrapped him in a grey shawl with long fringe. The water was above my armpits and I was holding Elaine above my shoulders and bracing my heels in with every step and kind of feeling my way and also looking back because there were big pilings washing down. If one hit me, I knew I'd go down. The man carrying Chub stepped in a hole where the sidewalk had washed away and went in over his head, and I guess he automatically threw up his arms...and he dropped Chub. I saw the man come up, feeling in the water for my baby and here I am holding one baby and can't do a thing about it and my other baby's gone. But Chub drifted into the cedar tree in front of Lippincott's house and we both saw him at the same time: He yelled and I yelled. The fringe had caught in the branches, and the man reached into the water under the shawl and scooped him up. He was hollering mad; he coughed and sputtered and started yelling right away. 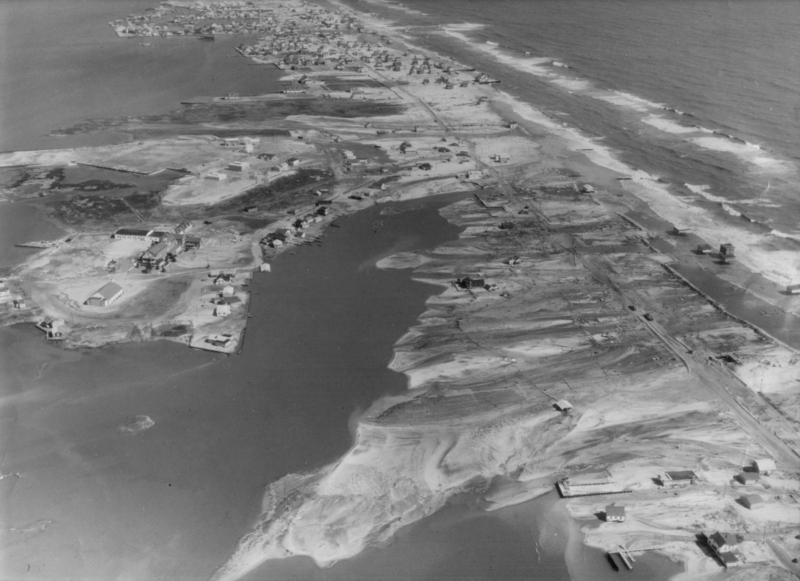 ExcerptRecalling his experience in the 1962 northeaster in Sea Isle City, Adolph Wilsey considered himself "one of the lucky ones"
Those tides! Tuesday morning was a bad one. Waves came banging into the bulkhead like the wrath of God. The bulkheads held but the sea, whipped by the wind, came right over the top of them. That was only the beginning. Tuesday night’s tide was worse. The granddaddy of them all came Wednesday morning. It smashed the bulkheads like kindling wood and the ocean came roaring at us, rushing into the streets. It ripped away an eight-foot section of my living room wall and pounded out two windows. Water and sand poured over my floor. Furniture was knocked over. Between my house and the ocean there used to be three houses. They were swept away. Not a trace of them was left. The night before the last tide I tossed on my bed, fully clothed. Since my wife died in January I’ve lived alone. Sometimes the house is pretty quiet but it wasn’t quiet that night. The ocean was rolling right underneath me. When I got up in the morning, that big tide had done its work. I figured it was time to get out. He grabbed a photograph of himself with his wife, eight children and sixteen grandchildren, shut off the gas — the electricity and phone had been out since Tuesday — and waded to the house of a friend, Tom Jefferson. It was a little scary. The water was deep and the current was swift. I finally found a board to hang onto in case I got swept off my feet. We went up to the third floor and looked out over the city. It was a sight to see. It was like a vast, half-drowned junkyard. 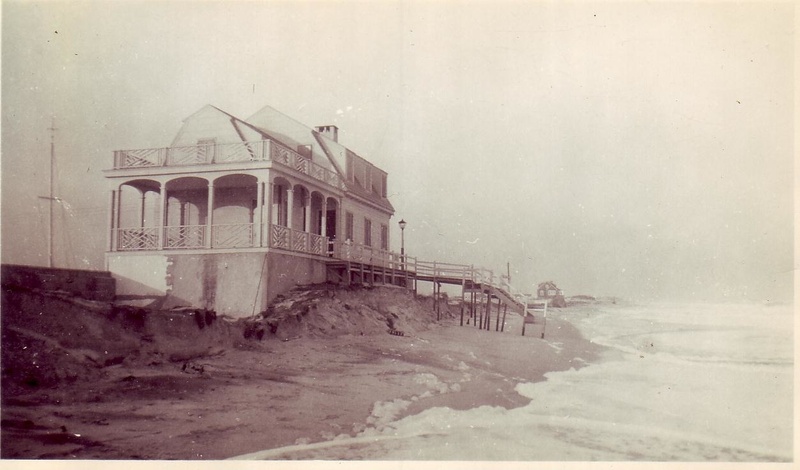 For a while we watched the dismal sight of our neighbors’ homes being washed into the ocean. 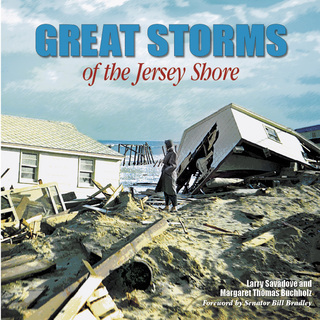 ExcerptJoel and Wanda Montgomery recall their survival during the 1962 northeaster in Barnegat Light. It didn't seem unusually windy at first, but then the big picture window started to bow in and out. We got in the truck to go to the firehouse. At the boulevard I saw a big wall of water coming at us. It was just like standing in the surf. The water broke over the truck and filled up the inside. We were sitting waist deep in the water with our dog, Duchess. I said, "Are you crazy? As cold as I am now, if I get knocked down by a wave I'll never get up again." I didn't want to leave the truck and he's telling me we should, so I opened the truck door and I said, "Come on, Duchess, we're going home." Now this was a Chesapeake; she'd swim through anything. And she put her head down between her paws and started to whine. I shut the truck door and I said, "If that dog won't go, I ain't going, either." They sat there for a while. Waves broke against the truck, which shifted uneasily. Things bumped them. The snow had turned to rain. Joel decided he'd go for help. "I got out to try to make it back to the house, but it was like a river. I was afraid to make a break for it." Hunched in the racing current, the wind blasting his ears, the rain batting his eyelids, Montgomery thought he heard a motor. I finally saw something like two little flashlights, not headlights. It was a guy in a truck and the dashboard lights were reflecting off his glasses. I jumped on the sideboard and pounded on the window. The guy thought the devil had him. It turned out to be a Coast Guard truck. The couple, and Duchess, were safe.